Mumbai: Ranbaxy Laboratories Ltd, India’s top drugmaker by sales, on Wednesday swung to a loss of ₹ 465 crore in the September quarter hurt by foreign exchange transactions. Lipitor’s patent protection expires 30 November, after which two new versions of the drug are expected to be sold by Ranbaxy and Watson Pharmaceuticals. They are expected to be the only competitors for six months, after which a number of other copycats may enter the market. Ranbaxy’s smaller Indian rival Dr Reddy’s Laboratories Ltd also has a US-approved generic version of Lipitor. Ranbaxy’s scheduled launch of the world’s top-selling drug has been clouded by speculation that regulatory troubles could derail its plans. “We have no comments to offer (on the Lipitor launch)," a Ranbaxy spokesman told Reuters over the telephone. “Ranbaxy continues to co-operate and negotiate with the US FDA (Food and Drug Administration) and the department of justice for a comprehensive settlement to address its regulatory issues," the Delhi-based drug maker said in a statement. As the Lipitor patent expiry nears, analysts are speculating that Teva Pharmaceutical Industries Ltd, the world’s biggest generic drug maker, could be gearing up to sell its own copycat version of the blockbuster cholesterol-lowering drug. The Delhi-based company’s profitability in the fiscal third quarter was hurt by foreign exchange losses worth ₹ 651 crore as it swung to loss from a consolidated net profit of ₹ 310 crore year earlier. The forex loss was owing largely to the requirement of mark-to-market long dated derivative transactions entered into by the company in earlier years and which remain currently outstanding as well as on the forex loans, it said. The drug maker’s profit before interest expenses and foreign exchange losses stood at ₹ 197 crore. 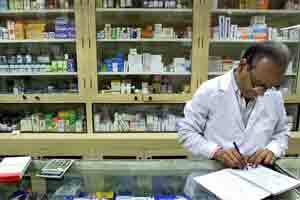 A Reuters poll had forecast net profit of ₹ 168 crore for the drug maker. Net sales rose to ₹ 2,023 crore in the quarter ended September from ₹ 1,877 crore a year earlier. Ranbaxy follows a January-December year. Ranbaxy said sales in North America, its biggest market, grew to ₹ 472 crore in July-September, while Europe business grew 21% to ₹ 331 crore. The company’s India business grew slowly by 6.5% to ₹ 515 crore in the September quarter as “therapy part of business was affected by industry-wide slowdown in the anti-infective space," it said. Shares in Ranbaxy Laboratories, which have fallen more than 20% year-to-date compared with a 10.4% fall in the benchmark healthcare index, fell 4.37% on Wednesday to ₹ 475.10.